#Weekending: Kensington local style | APEX Public Relations Inc. Managing Partner Ken Evan talks about his weekend in Kensington Market. Although I spent my formative high school years in Quebec, I was born and raised in Toronto and have made various parts of the city south of Bloor home— from Parkdale and The Beach to Little Italy. A salient memory when I was in grade school at Brown School at Avenue and St. Clair was going to Kensington Market with my Mom to peruse Jewish delis, bakeries and butchers. I felt then that the market was an exciting kaleidoscope of people, shops, smells and sounds and that feeling remains as intense today as it did then. So much so that I now live in Kensington. And although many of the Jewish merchants and influences have been replaced by South American, Asian, Mediterranean, European and even indigenous small business entrepreneurs (as well as an overall whiff of gentrification) the market remains profoundly special. Although I’d love to see pedestrian Sundays be a permanent weekend fixture. And by now, many of you who follow Now Magazine, Blog TO or Postcity, have heard of the market’s many outstanding shops, such as Sanagan’s Meat Locker, Blackbird Bakery and Hooked. You’ve likely lined-up for some of the best tacos in town at Seven Lives or chowed down on some awesome indigenous inspired fare at Pow Wow on Augusta. So, a glimpse into my perfect weekend afternoon in the market. Essence of Life: This family owned health food store is where I get my pantry staples, especially delicious, authentic Korean kimchi. Café Pamenar: One of the best European style cafes in the city with a lush patio out back and a perfect people watching terrace out front, serving great coffee, craft beers and wine. 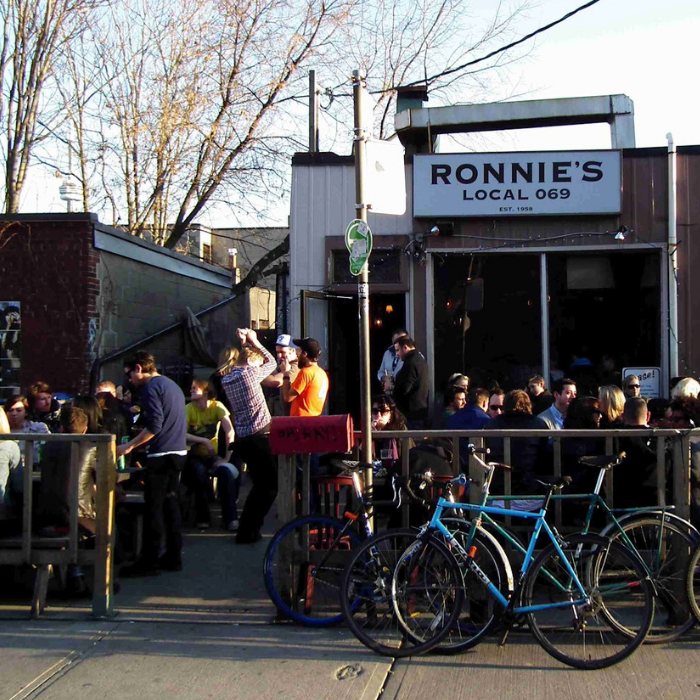 Ronnie’s Local 069: I adore Ronnie’s. A veritable “dive bar” owned and frequented by locals in the neighbourhood with a great selection of beers. The patio is probably my favourite spot to sit, watch and reflect in the city. Cheese Magic: It’s getting increasingly competitive in the market on the cheese front with the growing offering from 4 Life Natural Foods, but I’m loyal to Cheese Magic. Great customer care and a wide selection of Quebec and European cheeses. Model Citizen: The market is more famous for its vintage apparel offerings, but owner, Julian Finkel, has been bringing extremely well curated casual men’s fashion to the area for years now. I rarely enter without leaving with something unique. Poetry Jazz Café: If you haven’t poked into this very cool bar with a solid cocktail offering, you must soon. It was also the spot to hang-out at this fall’s Kensington Jazz Festival (Sept 14 – 17). There are obviously tons of other inspiring nooks in the city to explore and celebrate. However, Kensington monopolizes a lot of my leisure time as it keeps on giving, no matter how much it changes. Ken Evans is Managing Partner at APEX Public Relations. Check out more of our #Weekending series until the official end the summer.